My Outside Voice: Recipe of the Week! Holiday Appetizers! Recipe of the Week! Holiday Appetizers! This time of year I am always trying to whip something up, looking for new recipes, trying new restaurants. Here are a couple of appetizers that I made last week for my holiday cocktail party Saturday. They are both very easy, I made them in advance during the week and then just heated them up prior to the party on a cookie sheet. I LOVE the mushroom tartlets, however, the mini quiches, can just as easily be bought at Costco, I just like to make them. If you have any alternatives to these recipe, please send them my way I love to add to my growing list. Both recipes courtesy of Pillsbury. 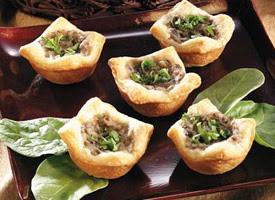 The Mushroom tartlets are SO easy that I doubled it and froze half. 1. Heat oven to 375°F. 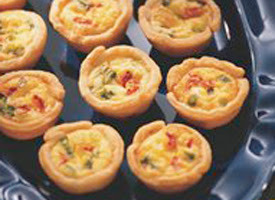 Spray 24 mini muffin cups with cooking spray. 2. Remove pie crusts from pouches; place flat on cutting board or pastry cloth. With 2 1/2-inch round cutter, cut 12 rounds from each crust. Press 1 pie crust round into bottom and up sides of each muffin cup. 3. Place 1 tablespoon cheese in each cup. Top each with a few onion slices and pimiento pieces. In 2-cup measuring cup, beat eggs, milk, salt and nutmeg with fork until well blended. Pour mixture into crusts, filling to within 1/4 inch of top. 4. Bake 25 to 30 minutes or until golden brown. Cool 2 minutes. With tip of knife, lift quiches from cups. Serve warm. 1. Heat oven to 350°F. Melt butter in large skillet over medium heat. Add mushrooms, flour, onion and garlic; mix well. Cook 5 minutes or until vegetables are tender, stirring frequently. Add cream and cheese; mix well. Cook 2 to 3 minutes or until most of liquid has evaporated, stirring frequently. 2. Unroll dough into 2 long rectangles; firmly press perforations to seal. Cut each rectangle into 12 squares. Place 1 square in each of 24 ungreased miniature muffin cups. Firmly press in bottom and up sides, leaving corners of dough extended over edges of each cup. Spoon 1 heaping teaspoon mushroom mixture into each cup. 3. Bake at 350°F. for 9 to 12 minutes or until golden brown. Sprinkle with parsley. Cool 5 minutes. Remove tartlets from pan. Serve warm. Store in refrigerator.